Vivekananda Kendra Kanyakumari, Madurai branch organised a Residential KARYAKARTHA PRASHIKSHAN SHIBIR at stanik level in Swami Vivekananda VidyaMandhirCBSE School, Madurai from 5.00 pm on 25-05-2018to04.30 pm on 29-05-2018. Organizing team consisted of 10 Karyakarthas. To channelize the energy of Youth for productive Nation building work. The camp started with Krida yoga. Sri.SundaramJi, C.A., General BodyMemberof Vivekananda Rock Memorial and Vivekananda Kendra, inaugurated the camp by his address emphasizing the importance youth potential. 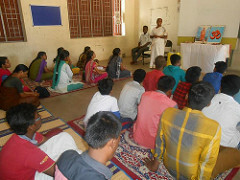 Purpose of the camp was also conveyed to the participants. The participants were grouped into three namely–Swami Vivekananda, Sister Nivedida&MahakaviBharathiar. The participants shared that being without mobile phones was new to them, they could understand the importance of time management, they would practice yoga daily and they felt free to share their views without hesitation during Manthan and enjoyed playing value based games. They also said that they would be a part of organizing team in upcoming Kendra activities. The concluding session started at 3.00 pm with prayer followed by introduction ofBhuvaneshwariDidi, Nagar Sankatak, NagarkovilandShibhirgeeth. BhuvaneshwariDidi gave a speech about ourresponsibilities and inspired the youth to serve the country. All did pushpaanjali to Omkar and took Sankalpa as to work for the nation.